Jeera Murgh is a simple and aromatic cuisine from Uttarpradesh. This cuisine can be termed as modern Mughlai cuisine, since this is a blend of modern and traditional cuisine style. This dish is so aromatic that it pulls people close to it. Jeera Murgh can be seen in the menu card of popular restaurants and hotels. Not much of ingredients in making this and its tastes delicious. Another factor is this recipe can be cooked both on stove and as well as using oven. Basically this is a Uttarpradesh and Delhi recipe and is in a way called Mughlai since it is cooked using fresh cream and butter. It is high in calories but once in a while rich food is ok these days. The important point to be noted in this recipe is that it should be served hot , as soon as it is cooked. Since it tastes not only best when served hot, fresh and just cooked but also is aromatic making it tempting for foodies. I give this 5 stars for colour, aroma and taste, so just read further for the recipe of Jeera Murgh. Thinly pared rind of 1 lemon, in one piece. 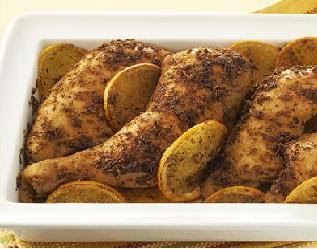 Put the chicken pieces on a large plate and rub them all over with the lemon juice. Set aside for 20 minutes, then pat dry with kitchen towels. Mix the salt, cayenne and flour together on a second plate and roll the chicken pieces in it, shaking off any excess. Melt the butter in a frying-pan. Add the chicken pieces and fry until they are evenly browned. As they brown, transfer the pieces to a plate. Add the onions, garlic, ginger and cumin seeds to the pan and fry until they are golden brown. Stir in the yogurt, cream and lemon rind. Return the chicken pieces to the pan and turn in the mixture to coat thoroughly. Bring to the boil, reduce the heat to low and cover. Simmer the chicken for 1 hour, or until it is cooked through and tender. Uncover the pan for the last 20 minutes to allow the sauce to thicken somewhat. Discard the lemon rind and transfer the chicken and sauce to a warmed serving dish. Serve at once. Shelflife: 1 day. Best fresh. Serving Suggestion: Serve hot just when cooked with Naan or Roti. Use fresh Cream while cooking. Double heavy cream is available readymade in stores and is made from skimmed milk. It is much thicker and taste more delicious. If you are cooking this cuisine using a oven, then cook it over 650 C and stir it by taking in out after every 20 minutes after adding the yoghurt and cream. Dont forget to remove the lemon rinds. Use large peices of chicken for cooking this recipe. Fry the jeera in the pan till a slight aroma comes from it and it turns brown, so that the cuisine turns out aromatic and fresh jeera aroma spreads when served. Click here to know more about Uttar Pradesh foods and recipes - An Introduction To Uttar Pradesh Foods And Recipes. The main purpose of this blog is to share Indian recipes and Cuisines. Indian recipes ranging from north indian to south indian would be featured and posted here. All your comments and responses are most welcome. I am Dhanashree. I am a 3d animator from mumbai but cooking has always been a passion for me. I take time to experiment and learn and expertise it whenever possible. In this blog, i am contributing some good recipes. I would like to have support from all my near and dear ones.